Juhi Artz designs wooden lights of all types on jungle theme reflecting animals in the shape of horns, fire, jungle animals. This Star Wooden Hanging Lamp is a mosaic of knots of the pinewood. This beautiful piece is meant for dim lit rooms to either give a spot light or feeling of warm log in the room. The mosaics are made such that you will be able to spot jungle theme such as owl eyes,butterfly, etc. Valued as a reliable manufacturer and supplier, we render the premium quality of products. We offer lamps with resistance against termite, elegant design and eye-catching appearance. 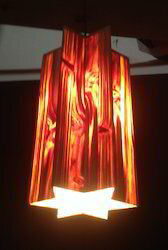 Strong logistic support has helped us in delivering the rendered wooden floor lamp within promised time frame.